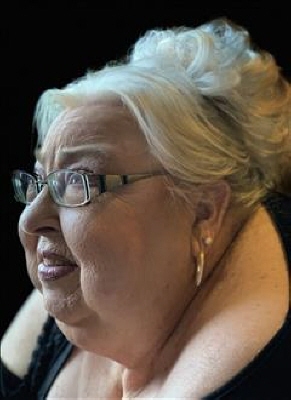 Sharon Kay Briones (Snow), 73, of Oklahoma City passed away Saturday, April 13th, 2019 in the Integris Baptist Hospital in Oklahoma City, Oklahoma. Visitation for family and friends will be held Thursday, April 18, 2019 from 12 to 2 PM with graveside services following at 2:30 PM in the Duncan Cemetery under the direction of the Bailes-Polk Funeral Home. Sharon was born at Duncan, Oklahoma on February 17, 1946 the daughter of Author Ward and Helen Ruth (Teague) Snow. She was a graduate of the Duncan High School in the class of 1964. She was enployed by Southwestern Bell (Ma Bell) of Dallas then transferred to Duncan until they closed. She worked the jewelry counter at several local department store where she most enjoyed meeting and greeting the public. After her retirement her true love was being NANA to her grandchildren who she loved dearly. She was a member a member of the Heritage Oaks Church of the Nazarene. She was preceded in death by her parents and two brothers Wendell and Larry snow and a beloved sister-in-law Mary Jane Snow. Survivors include her son Shea Briones of Oklahoma City, Oklahoma; her daughter Tiffani Eloulladi and her husband Charaf of Oklahoma City, Oklahoma; four grandchildren Brandon Briones, Gabriel Briones, Zayne Eloulladi and Kayeley Briones all of Oklahoma City; brother Gaylon Snow and Sister Shernell Jones. To send flowers or a remembrance gift to the family of Sharon (Snow) Briones, please visit our Tribute Store. "Email Address" would like to share the life celebration of Sharon (Snow) Briones. Click on the "link" to go to share a favorite memory or leave a condolence message for the family.